Exuma, a district in the Bahamas is stunningly beautiful. It consists of almost four hundred small islands, positioned languidly along 250 miles of the Atlantic Ocean north of Cuba. Many of the islands are uninhabited. Yet one of them, Big Major Cay has a population that might surprise you. 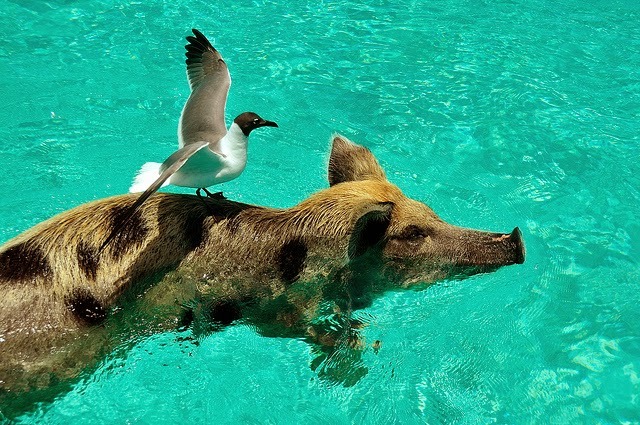 There are pigs on the island and when they are not doing their best impression of beach bums they take to the water. These are the swimming pigs of the Bahamas.